KERI ATAUMBI, 2017. Photograph by Raechel Running. BUMBLE BEE RING of oxidized sterling silver, twenty-two karat yellow gold, brilliant-cut white diamonds, yellow sapphires, black pearl, 5.1 x 4.4 x 5.1 centimeters, 2011. Photographs by Keri Ataumbi except where noted. It is late May in New Mexico. Santa Fe has recently been hit by twelve inches of snow—here today, gone tomorrow. The desert has appreciated the moisture; wild flowers pop up and some of the cacti blossom. An accompanying frost, however, has decimated the Concord grape vines Keri Ataumbi has been cultivating at her home in Cerrillos Hills just south of Santa Fe. She shrugs her shoulders as she beckons a visitor into her studio. Ataumbi is preparing for the annual Native Treasures Indian Arts Festival at the Santa Fe Convention Center. It is the kick-off to the busiest season in the city when various arts and cultural festivals draw people from around the world. The Native Treasures show benefits the Museum of Indian Arts and Culture (MIAC) in Santa Fe. Ataumbi and her sister, master bead artist Teri Greeves, have donated works. In 2015 they were designated “Living Treasures” at the festival. On this May afternoon Ataumbi is also looking ahead to future shows. Earlier in the day, Elizabeth Evans from Four Winds Gallery in Pittsburgh had come by to look at new work, which Ataumbi’s apprentice, jeweler Tania Larsson, is busy photographing. The mood in the studio is bittersweet: after two years with Ataumbi, Larsson is returning to her home in Yellowknife, in Canada’s Northwest Territories. Her story is remarkable: Of Gwich’in and Swedish descent, Larsson was born and raised in France and moved to Canada at age fifteen. Her mother, Shirley Firth Larsson (1954-2013), was an Olympic cross-country skier. The two women met when Ataumbi filled in for a friend to teach a jewelry class at the Institute of American Indian Arts in Santa Fe where Larsson was pursuing a fine arts degree. The only native college with a focus on fine art, IAIA enrolls students from tribes across North America. Ataumbi found it refreshing to be around young minds, and she was impressed by Larsson’s go-getter attitude and took her on. Ataumbi herself came to jewelry in her late twenties; she has been a full-time craft artist for going on eighteen years. She started her artistic life as a painter, but switched to jewelry after taking a basics course at the Santa Fe Community College. 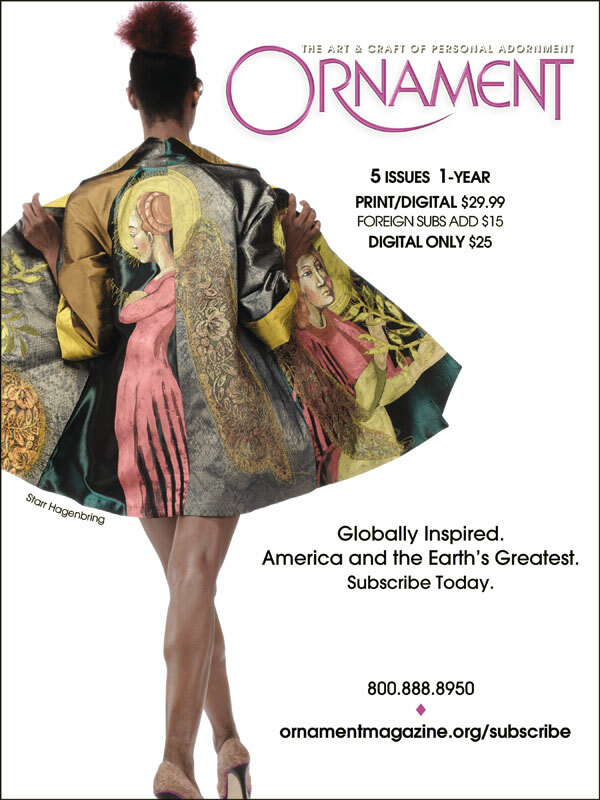 Today, she boasts a thriving jewelry business and a special stature among the makers of wearable art in America. Her approach to art and life is the same: Ataumbi gets inspired by an idea and sets out to make it happen. Sometimes it will take her a couple of years to figure it out, designing and drawing, reworking and rethinking. When she has finally settled on the concept, she may have to turn to friends to pull it off. For example, a piece with a prominent pavé setting required that she learn the technique. She sought assistance and acquired a new skill in order to fulfill her vision. It is one reason why she loves being in her field: there is always something new to learn. Ataumbi works in series, developing a theme then exploring different ways to represent it. For example, her insect collection featured damsel flies, beetles, water bugs, yellow jackets, and her “girls,” the honey bees she cares for (she calls herself a “lackadaisical beekeeper”). The water bugs appear in a set of earrings, their small eighteen karat gold bodies hugging black Tahitian pearls. A brooch inspired by a Datura flower features twenty-two karat gold honey bees exploring its crocheted silver folds. THAW-YAW KOOIE EARRINGS of eighteen karat yellow gold, white diamonds, coyote fur, 8.3 x 5.7 x 1.3 centimeters, 2016. Model: Amber Morning Star Byers. Photograph by Bri Crimino. Ataumbi’s pieces have tended to move between structural and surface-oriented—and abstract—on the one hand and pictorial/figurative on the other. The oxidized silver arrow cuff from her Archery series, for example, has a hard-edge dynamism, even with its various accents: eighteen karat gold, six rose-cut diamonds, and twenty-eight brilliant-cut diamonds. The series arose after Ataumbi took up archery as a way to deal with carpal tunnel syndrome. In the pictorial category, Ataumbi often draws on animals, including the “critters” that frequent the desert around her home and studio: snakes, tarantulas, birds, and spring peepers. She can be quite literal in her representations of these creatures, but more often she stylizes their shapes. A snake brooch features a sleek gold serpent with diamond eyes sliding along a sterling silver twig. Silver, platinum and gemstones, as well as such natural materials as buffalo horn and brain-tanned buckskin, are also on Ataumbi’s list. She tends, she says, to use materials in an untraditional manner. She points to platinum: Instead of a high shine, she likes to leave it in a rough state with a kind of buffered texture. “I think of the material as an artist, not as a trained jeweler who has a degree in stone setting,” she says. She sets out to make an art object rather than a piece of fine jewelry. Ataumbi and her husband enjoy sailing—on lakes in New Mexico, in Turkey, the Caribbean, and Maine, among other places. This connection to the water led to the Ocean collection. Here again, the pieces range from abstract to more literal. Sometimes it is the material, such as coral, that ties the work to the theme; at other times, it is the image: a squid ring, a sea turtle cuff. The latter piece was inspired by snorkeling and watching turtles graze in sea grass. The turtle is carved from a mabé pearl; the grass, made of twenty-two karat gold, is sprinkled with sapphires and diamonds. THAN TDAY KX’OLE-PAHN NECKLACE of sterling silver, eighteen karat yellow gold, twenty-two karat gold, rose-cut colored diamond, brilliant-cut white diamonds, sapphires, mother of pearl, watercolor on velllum, hand-painted, 5.1 x 2.5 x 81.3 centimeters, 2016. Photograph by UnderexposedStudios.com. Ataumbi’s mussel shell necklace is among her boldest creations. Thirty or so of the bivalves were formed using a hydraulic press and then were etched, soldered and connected by rivets. One gold shell stands out from the silvery gray array of its oxidized silver neighbors. A hook allows the wearer to wrap it twice around the neck or leave it long. The piece was featured in “Native Fashion Now”, which originated at the Peabody Essex Museum in Salem, Massachusetts, in 2014, and finished up at the National Museum of the American Indian in New York City this past September. 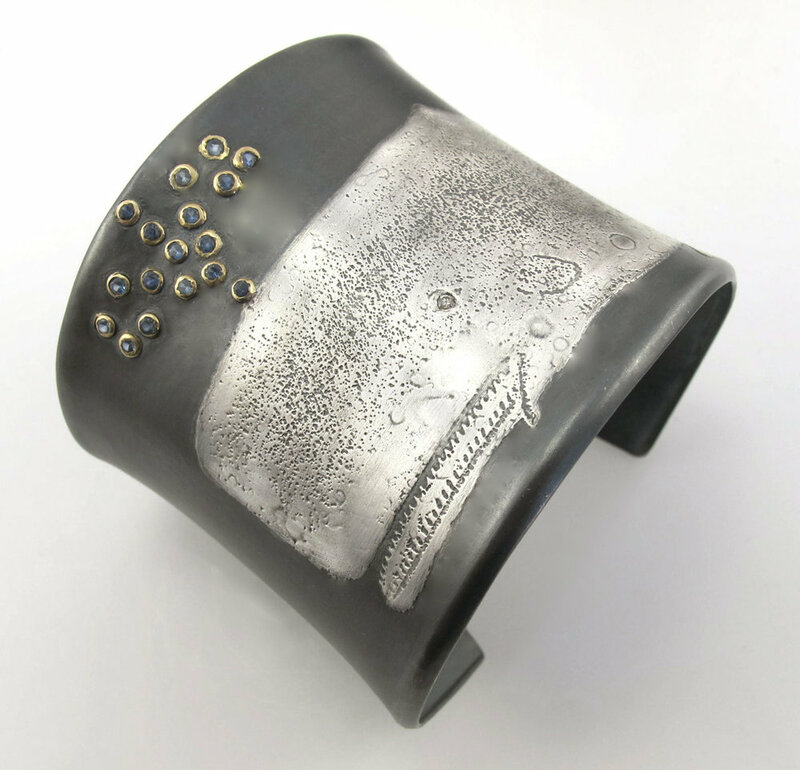 MOMMY’S SERIES: TDAHN KHAW CUFF of oxidized sterling silver, twenty-two karat yellow gold, brilliant-cut white diamonds, 5.1 x 4.4 x 5.1 centimeters, 2015. In addition to fine moccasins, belts and tea dresses, Ah-be-hill wore jewelry from her extensive collection. In her Mommy’s Series Ataumbi set out to recreate some of the pieces she had inherited. Developing the work was a way to both honor her mother and work through her grief, which had left her in a kind of creative limbo (her mother’s death had been unexpected—she suffered a heart attack in her yard). Among the pieces was a vintage Harvey ring her mother used to wear on her little finger. Fred Harvey (1835-1901) was a British-born entrepreneur who is generally credited with helping to build a market for Native American jewelry in the American west. The original ring, in silver, was falling apart so Ataumbi remade it in her own style, using eighteen karat gold and adding her signature accent: a small diamond set in the underside. The actress Melaw Nakehk’o wore this dazzling vertical ring, along with a set of Ataumbi’s gold orb earrings, on the red carpet at the premiere of the 2015 film The Revenant in which she starred. The multipart piece, which won best in show at the 2016 Indian Market in Santa Fe, features a miniature portrait of Ataumbi’s grandmother, Carrie Susie Ataumbi, for whom she was named. Certain elements of the piece conjure her mother, such as the white buffalo symbol, which is made from mother of pearl. “It’s hard to put something like this up for sale,” she notes. She hopes a museum might acquire it. Recreating her mother’s jewelry led Ataumbi to reconsider her attitude toward Native American jewelry. She had generally steered clear of “native aesthetic” in favor of her own creative vision. When she was younger, she had made a conscious decision to avoid being pigeonholed as a native artist (“a lot of our young native artists go through this,” she explains). Since her mother died, Ataumbi has begun to rethink this stance. “At forty-five, total mid-career,” she states, “I’m owning it finally.” While she has always drawn on traditional Kiowa imagery and materials, in some of her new pieces she has been mixing in the things that “are valuable to us as native people” with things that are valuable in the jewelry world. One example is a pair of earrings that incorporates porcupine hair. Some of these pieces appeared in “From My Studio: Feathers to Diamonds” at the Shiprock Gallery in Santa Fe in July. Ataumbi has collaborated on pieces with several artists, including jeweler Robin Waynee and beader Jamie Okuma. Waynee, who lives in Santa Fe, is of German and Saginaw Chippewa descent and “likes very clean lines,” according to her collaborator. A multiple Saul Bell Award winner, she and Ataumbi partnered on an earrings-ring-necklace set related to the insect series. They donated the necklace to the Indian Market’s gala auction in 2011, in support of the Southwest Association for Indian Arts (SWAIA). Ataumbi’s collaborative pieces with Jaime Okuma have drawn on the latter’s award-winning beadwork. Of Shoshone-Bannock and Luiseño heritage, Okuma, who lives on the La Jolla Indian Reservation in Pauma Valley, California, is known for her customized designer footwear as well as exquisite beaded ornaments. The artists used three well-known images of the renowned Native American cultural figure as sources: Simon van de Passe’s 1616 engraving, the Sedgeford Hall portrait from the 1750s and Thomas Sully’s 1852 rendering. The complex piece, which incorporates a wide range of materials, including antique glass, buckskin, twenty-four karat electroplated beads, eighteen-karat yellow gold, fresh water pearls, indigenous wampum, and diamonds, was purchased by the Minneapolis Institute of Art for its permanent collection in 2014. The two have teamed up since to co-create a Marilyn Monroe ring and a bracelet with a human skull, For the Love of Art, inspired by German artist Damien Hirst’s diamond-encrusted skull and For the Love of God (2007). FOR THE LOVE OF ART BRACELET, collaboration with Jamie Okuma of oxidized sterling silver, eighteen karat yellow gold, rose-cut colored diamonds, black diamonds, antique seed beads, black diamond beads, brain-tanned buckskin, 5.1 x 4.4 x 5.1 centimeters, 2014. POCAHONTAS RING, collaboration with Jamie Okuma of eighteen karat yellow gold, rose-cut colored diamonds, brilliant-cut white diamonds, antique seed beads, brain-tanned buckskin, 5.1 x 5.1 x 5.7 centimeters, 2014. Collection of Minneapolis Institute of Art. Keri Sue Ataumbi was born in Lander, Wyoming, on the Wind River Indian Reservation, home of the Eastern Shoshone and Northern Arapaho tribes. She grew up on the Eastern Shoshone side of the reservation. Her mother, Jeri Ah-be-hill, had met her husband, Italian-American sculptor Richard Greeves, in St. Louis. They eventually moved to Wyoming where she opened the Fort Washakie Trading Company in the mid-1960s. She ran it for nearly thirty years. Both parents had a major influence on Ataumbi’s growth as an artist. She remembers her father welding horseshoes to create a garden gate and pouring bronze to create one of his romanticized western figures for which he is well known. As she told Southwest Art Magazine in 2004, she came to love spending time in the foundry. She and her sister learned to think for themselves, to tackle the challenges of creating objects. Her mother’s grassroots commitment to Native American artists inspired her from early on. In her teens, while working at the Anadarko Southern Plains Museum, Ah-be-hill encountered a native artist who was trying to place her moccasins, an exquisite pair with extraordinary beadwork, in the museum’s shop. Outlets were few, and after coming upon the moccasins on a gas station counter alongside the Wrigley’s gum and cigarettes, Ah-be-hill felt compelled to bring this work to a broader audience. 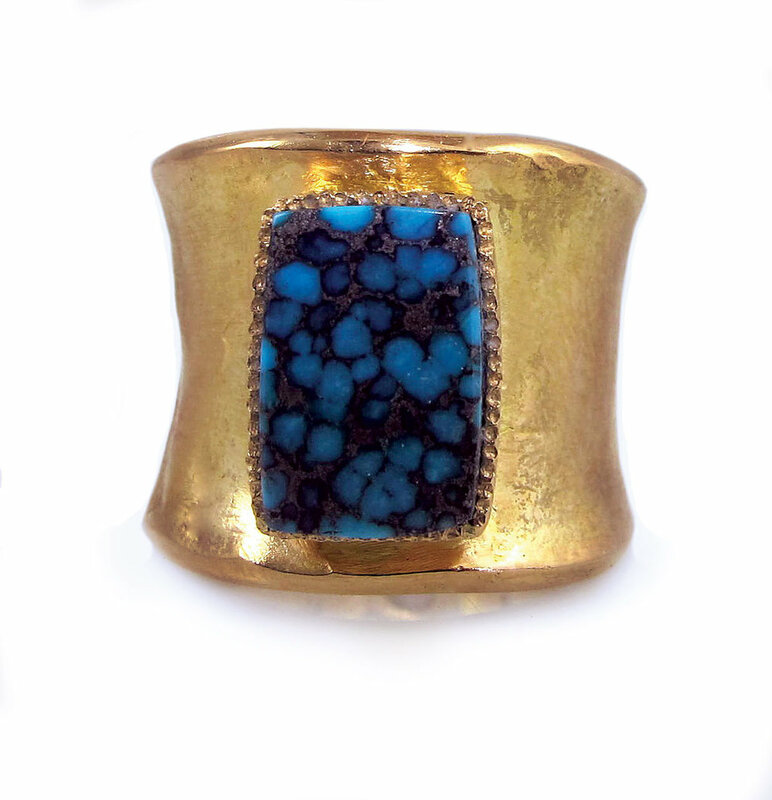 BISBEE TURQUOISE RING of eighteen karat yellow gold, Bisbee turquoise, white diamonds, 2.5 x 2.5 x 1.9 centimeters, 2015. Ataumbi also remembers the native traders coming by her mother’s store in their RVs to sell their wares: Navaho rugs, sterling silver, pottery. Her mother would buy “bread and butter” stuff—earrings, rings, beadwork items, and the like—as well as the materials for making them: hides, beads, needles, etc. Then she would usher in her daughters, who helped in the store, to look at the “good stuff” and let them pick out something. Ataumbi still remembers seeing her first Charles Loloma piece, in the back of a Winnebago. Loloma (1921-1991) played a major liberating role in the development of the contemporary Native American jewelry movement. At age eight or nine Ataumbi considered becoming a mortician because she had read that da Vinci used to go to the morgue to study cadavers. “That was really silly,” she admits, yet it foreshadowed her determination to pursue a life in art. Bartel had attended the Rhode Island School of Design and recommended it to Ataumbi. Looking back, she might have chosen a different route: RISD proved to be a “wrong fit,” plus a lot of unpleasant things happened while she was there, from having her car and house broken into to having a friend thrown in jail. After less than a year, she fled west to Santa Fe where her mother was living. Following a short stint in retail, Ataumbi established a landscaping business with a friend—“two women who didn’t have a clue but who were determined to figure it out,” she recalls with a smile. And figure it out they did, building a successful business. When her partner decided to go to medical school, Ataumbi found herself at a crossroads: would she carry on without her or embrace art full-time? Ataumbi is quick to point out that the whole time she was landscaping she was painting and showing her work at LewAllen Contemporary in Santa Fe. She would take time off to paint, working furiously for several weeks to produce work for shows. Her paintings at the time were “very surface-oriented, very abstract, very textured,” influenced by the contemporary Italian artist Francesco Clemente. She produced several series, riffing on Native American subjects, such as Séndé, the Kiowa trickster, and Stony Road, one of the survivors of the great flood. While her paintings sold, Ataumbi felt the need to return to school. She earned an Associate of Fine Arts degree at the IAIA, then transferred to the College of Santa Fe (now the Santa Fe University of Art and Design). While not especially strong in the arts, the small Catholic school had a terrific art history department. One of her teachers there, artist and clothing designer Linda Swanson, had a profound impact on her thinking. “She taught me how not to fear intellectualism and criticism,” Ataumbi recalls, and to communicate in her own voice. Over time Ataumbi built up her business while doing random jobs to help make ends meet. She recalls with a smile her first showing at the Heard Fair in Phoenix: dreaming of selling out and being the next big thing, she managed two “pity sales”: purchases by her mother and a cousin. The steps forward were slower than she wished, but she was dogged. Her studio is located in what was once a small barn space renovated by her husband, Joel Muller, a contractor (her office is in the former chicken coop). The walls are decorated with a wonderfully eclectic assortment of art and objects, many from her mother’s collection. Here and there are her own paintings. Although painting was her first love, Ataumbi has found it to be anxiety-provoking, and yet she returns to it when time allows. ARROW CUFF of oxidized sterling silver, eighteen karat yellow gold, rose-cut colored diamonds, brilliant-cut white diamonds, 5.1 x 4.4 x 5.1 centimeters, 2015. Showing off her laser welder, Ataumbi admits to feeling love for an inanimate object. “I can make a weld that is half the width of a hair,” she says with awe. She keeps some of her tools in a handsome Japanese tea cabinet from the 1920s. She spends a lot of time in the Los Cerillos hills near her home, running with her dogs (“my studio assistants”), hiking and exploring. Ataumbi has lived in and around Santa Fe for going on thirty years now. She loves the mix of cultures and communities. The artists support one another. “I’ve run out of acetylene—got a tank?” She markets her work through several galleries, museum shops and fairs, including the annual Indian Fair and Market at the Heard Museum in Phoenix where she has won a number of prizes in several categories. She is considering entering some non-native fairs, but recognizes the challenge of putting together a cohesive body of work. “I tend to be all over the place,” she says. She also uses social media, including Facebook, to promote her work. Part of her mission as an artist is to educate people. When non-natives tell her that her work “doesn’t look native,” Ataumbi explains that she grew up on the rez, in a native home. “You can see the lightbulbs go on,” she says. She firmly believes, and has proven by her own example, that contemporary native jewelry does not have to fit a certain mold. After a week in Santa Fe this past May, Carl Little was ready to move there. “Santa Fe boasts the third largest art market in the U.S.,” he notes, “and it was the National Geographic Traveler World Legacy Award winner for Sense of Place in 2017.” In addition to a memorable visit with Keri Ataumbi, Little spent time on Museum Hill (where the Wheelwright Museum was featuring an extraordinary beadwork exhibition), took in the galleries on Canyon Road, and enjoyed the city’s high desert vibe. Little’s most recent book is Philip Barter: Forever Maine, published by Marshall Wilkes.